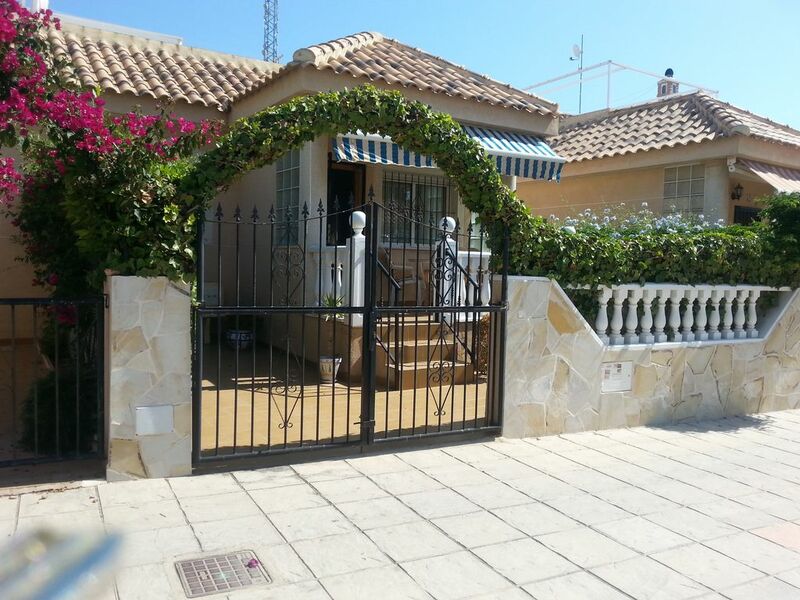 This lovely south facing semi detached bungalow is situated within the quiet residential urbanization of Campo-mar, in the very popular La Zenia resort. Within walking distance to all local amenities this is an ideal holiday home. Entrance is via a sun terrace with potted plants, patio table and chairs and stone ornate bench. It comprises lounge, dining room, kitchen, bathroom, double and twin bedrooms. Entry presents a bright tv lounge with comfortable seating and air conditioning. The dining room is spacious and furnished with a pine wood extendable table and four chairs. Both the double and twin bedrooms are situated to the rear of the bungalow and provide fitted wardrobes, storage space and air conditioning. Duvets are supplied for the cooler season. A foldaway guest bed is available for a 5th guest. The kitchen, which follows through from the lounge, is fitted with wooden units and is more than well equipped to cater for all your needs whilst on holiday. The family bathroom has walk in corner shower enclosure, vanity basin and an additional good storage cabinet. The air conditioning, which is fitted in the lounge and both bedrooms, will also convert to heat for those cooler evenings/season. The solarium is accessed via stairs from the rear of the bungalow and also offers a covered enclosure providing comfy seating with table and chairs. This is an ideal area to enjoy playing board games, cards etc. There is also room to sunbathe on the terrace. The swimming pool, which is private, is surrounded by high wall and screening, is located to the rear of the bungalow. It measures 8m x 4m in length and 1m to 1.8m in depth making this a good size for swimming. It offers Roman steps for easy access and flood lights for evening use. Four sun loungers are provided. Beside the pool is a terrace with ornate table and bench set and extra patio chairs, so that you might perhaps enjoy dining "al fresco". Adjustable awnings are fitted in this area should you require shade. For those who enjoy outside cooking, why not show off your cooking skills on the fabulous brick built bbq. A perfect holiday home in a lovely location. toilet, shower, Vanity basin and great storage space also. Beds are freshly dressed every changeover with fitted sheet, top sheet, pillow case and dress throw. Duvets provided in cooler months. Offering daily/weekly/monthly rates and payable to the local ISP to activate, either in person or via email prior to arrival date. Four hand towels, four bath towels and a bath mat provided fresh every changeover. Not heated. Measures 6m x 4m and 1.10m to 8m depth Easy access via Roman steps. Flood lights for evening use. Well maintained throughout the year. An end of stay cleaning and laundry fee of €60 is to be paid cash on arrival. This is a local fee and therefore not included in the rental cost. Bed linens and bathroom towels are provided fresh every changeover. Should you require a cleaning service during your stay this can be arranged at €60 and should be requested prior to arrival. Four bath, four hand towels plus bath mat are provided every changeover. Beach towels are not provided therefore we respectfully request that you provide your own for use around the pool and at the beach. There are ironing facilities A hairdryer is provided. It is an excellent property with all necessary facilities. Everything was so clean and pleasant. We really enjoyed our stay . The property is excellent .It is very convenient to shopping,restaurants, church etc. The pool area is amazing! Lovely and clean everything you need there easy reach all bars and shops.pool is great.Hope to go back next holiday. We had a great holiday with lovely weather too. The house was fine, and the pool was great. However the one thing I could say is that the ground around the Pool area needed a bit of weeding done, which was a little uncomfortable while trying to sunbathe. Georgina was very nice, and was on hand if needed. I thought the cleaning costs if we used the Barbecue (and we did not clean it according to their liking) was a bit steep, as were call out costs etc. However we enjoyed our stay, and would visit again. This bungalow is a little Gem, we have stayed at this property for the past 9 years.. It definitely gets 5 stars from us.. It has everything ur holiday home should have, wifi, fully kitted kitchen, amazing outdoor area & the beautiful private pool, nice & spacious inside & cleanliness is top quality.. Very close to shops, bars & restaurants & beach.. All round winner..
Just returned from a lovely stay at this Villa, Georgina met us there and went through everything with us, she was easy to deal with in person as she was when booking. The Villa is in a great location, walking distance to the great La Zenia Beaches, La Zenia Boulavard and lots of local restaurants and pubs also the Saturday market is very close by. The private pool is a great size and has the sun all day, it was perfect.. The one little down side was the Double bed was 2 single beds push together which is one of my pet hates but at the same time the single bed was very comfortable..
We would highly reccomend this house as it has everything you would want for a lovely holiday. Until next time, thanks for all everything Georgina. Thank you for your review Gabriel. Yourself and family were all so lovely to meet and I'm so pleased you enjoyed yourselves. The pool is a fabulous size to enjoy cooling down or having a lovely early morning swim before sun up and a cool down before retiring. I have noted your comments regarding the bed, however with the mattress topper this does give the opportunity to separate the beds should guests prefer to do so. I agree entirely that the location of the bungalow is so near to everything local. The beaches and facilities at them are excellent. I hope you will visit again on a future date. It's always great to see guests again. Orihuela Costa provides a vibrant nightlife, with many entertainers working along the coastal resorts with its wide range of pubs and restaurants to meet all tastes and nationalities. La Zenia itself is in the heart of the Orihuela Costa, providing easy access to both the AP7 motorway and the N332 coastal road. Virtually on your doorstep you will find on offer an array of large supermarkets, banks, shops, bazaars, restaurants and café bars (many providing great live entertainment). There are many local and beautiful beach resorts along the Orihuela coast and most have been awarded the blue flag in recognition of high quality and facilities. Within 15 minutes walking distance are the 3 fantastic beaches of La Zenia, all offering fabulous facilities including sun beds, parasols, beach bar (often with waiter service), toilets and wifi. During the high seasons, jet skis, banana rides and more can be enjoyed. Magnificent views are enjoyed along the cliff top coastal walk, which link to the nearby resorts of Playa Flamenca, Punta Prima, Cabo Roig and Campoamar. Why not stop off at one of these resorts for a cool drink. Spoilt for choice as there are 4 large supermarkets and a small but adequately stocked petrol station with shop, all only a few minutes walking distance. Every day a street market sets up at different resorts. The local market which is held every Saturday morning is located on the edge of Playa Flamenca, which is a mere 10/15 minutes walk. Here you will find in abundance fresh fruit, vegetables, cooked chickens and hams, pottery, plants, clothes, toys, bedlinen, household goods and so much more. Barter for a bargain. Campo-mar residencia is within very easy walking distance of many restaurants and cafe bars of varying nationalities to suit all palates. Therefore great choices. Only a few minutes walking distance between the Saturday street market and the AP7 Junction is the fabulous Zenia Boulevard Centro Comercial with over 5000 car park spaces, over 150 shops including Zara, Guess, Blanco, Primark, H&M, Cortefiel, C&A, Druni, Decathalon, Leroy Merlin, AlCampo supermarket and for entertainment value there is a fabulous children´s play area, a casino, a bowling alley, an enormous tv screen showing sports, music videos, link up games and there is often live entertainment provided in the way of music, dancing, magician etc. The centre itself is a pleasure to walk around if only for window shopping (if possible), a bite to eat or a favourite refreshment. The vibrant Cabo Roig, the popular Flamenca Beach Commercial Centre and the entertaining Villamartin Plaza are only a very short drive. The main town of Torrevieja with fabulous marina, promenade with many restaurants and café bars, large shopping centre and water park is only a 15 minute drive and every evening during the high and low seasons you will find an abundance of small market stalls providing local crafts along the front. British airways/Monarch/Rynair/Easyjet/Jet2 offering budget and scheduled flights from Stansted, Gatwick, Luton, Glasgow, Edinburgh, Prestwick, Dublin, Cork and other major European airports. There are two main airports which serve the Costa Blanca and these are Alicante, which is approximately a 50 minute drive to La Zenia and Murcia (San Javier), a smaller airport which is a mere 20 minute drive away. Airport transfers to and from both these airports can be provided, prices on request. Between 1 November to 30 April rental rates are reduced when booked on a monthly basis, ie book 4 weeks and pay for 3 weeks. Please enquire for further information. An end of stay cleaning and laundry fee of €60 is payable cash on arrival. This is a local fee and therefore separate from the rental cost. The returnable damage deposit, which is payable online with rental cost, is held by Home Away and refunded to you 7 days following your departure date after the property has been cleaned and a satisfactory check of the property has been completed. It is essential to note the following information: Check in / Check out service fees apply during unsociable hours: From 7am to 7.59am - €25 call out service charge, payable cash on arrival	From 8am to 9.59pm, no charges From 10pm to 11.59pm - €25 call out service charge, payable cash on arrival. From 12 midnight to 6.59am - STRICTLY NO SERVICE. Mistakes cannot be rectified. Access to the property is 4pm on day of arrival and must be vacated by 10am on day of departure. Unless otherwise agreed. Travel cot with mattress and high chair, if available, can be hired at the weekly rate of €15 per item payable cash on arrival. Please enquire. Alicante and Corvera airport transfers can be arranged if you require this service. Please enquire.